We have published several articles on our website that aim to help common people understand the basics on how to use solar photovoltaic at their homes and office. We have discussed on PV buying guide, solar panel prices, solar thermal/electric, grid and off-grid applications, inverters, etc in our previous articles. In this article we will delve into a little more technical details related to Solar PV (Photo Voltaic) that can help people understand a little more before buying a panel. Our intent is to provide useful information to people to help them make a right decision while buying a solar panel. What are Solar Photovoltaic Cells? Mono-crystalline Cell: Cells cut out of single crystal of silicon. In appearance they are smooth. They are most efficient types of cells (efficient in converting light to electricity) and also most expensive. Poly-crystalline Cell: A cell cut out of a block of silicon consisting large number of crystals. They are relatively inefficient as compared to mono crystalline cells and cheaper too. Thin Film or Amorphous Cell: These are made of non-crystalline (or amorphous) silicon placed as a thin film on a surface. They are least efficient and least expensive. They are also not rigid unlike mono and poly crystalline cells and thus can be folded into different shapes. Power of amorphous cells reduces in first few months of use and thus the quoted output of thin film should be that achieved after stabilization (source: solar-facts). What are Solar PV Modules and Panels? Module and Panel, although used interchangeably, are different terms. Module is the smallest assembly of PV cells, which is environmentally protected and has all the essential elements (interconnections, terminals, diodes etc) and can produce a certain voltage and current. For e.g. a module of 36 cells would produce 12 Volt. A Panel is a collection of one or multiple modules depending on the voltage and current desired. What are the voltages, current and watts produced by Solar Panels? If you had inquired about a solar panel, you would have encountered terms like maximum power (Pmax), Voc, Vmp, Imp and Isc. One thing that will worry all is: “will it work for my system”. Take the output of a panel and use it to charge a battery and then connect your system to the battery. In case you have multiple appliances to use then you will also need an inverter (inverter converts DC to AC) to control it. You can also use the panel directly just like you use a battery (producing DC output). Such a system is also called directly coupled system. The benefit of using batteries is that the energy can be stored and used whenever required. But if panels are used directly, then the energy can be used only when it is produced (or during the day time). Max Power (Pmax): This is the maximum power (or Watts) that the panel can generate at standard test conditions. The standard test conditions are typically of 1000 W/m2 of solar irradiance and 25oC temperature (source: nrel). Voc (or Voltage at Open Circuit): This is the maximum voltage a panel can produce at open circuit or when nothing is connected to it and when current in the system is 0. This is also at the standard test conditions. Isc (or Short Circuit Current): This is the current that would flow through the solar panel if it were shorted at standard test conditions. Vmp (or Voltage at Maximum Power): A solar cell has a characteristic of producing constant current up to a certain voltage at a given light level. If you see the above graph, the current is constant till certain voltage and the panel produces maximum power at this voltage. 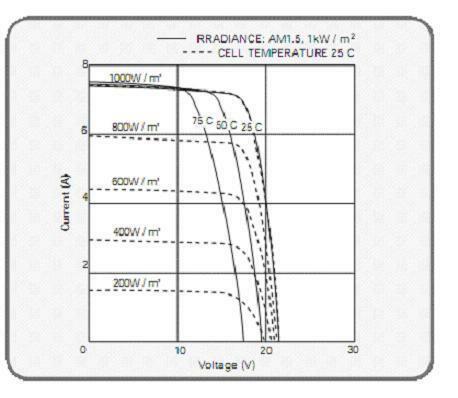 This voltage is called Vmp and is calculated at standard test conditions. Imp (or Current at Maximum Power): The current that a panel produces at Maximum power at Vmp is the current at maximum power. From all the details above, there is one myth that is broken: “A solar panel would produce maximum power on the hottest day in a year”. In fact higher temperature decreases the power output. A colder day (with about 30-35 degrees temperature) and good sunlight will result in better output from a solar panel. What is a charge controller or solar regulator? Now as it is established that a solar panel will not produce constant voltage or constant current, it cannot be used directly as a battery. One needs to put a “charge controller” or “solar regulator” to control the voltage and current that is generated from a solar panel. A MPPT (or Maximum Power Point Tracking) charge controller is used for Direct Coupled system (or a system where the load is connected to the panel directly) that regulates the output voltage from a solar panel. Panels mounted on a frame. Panel mounted on a frame. MPPT (Maximum Power Point Tracking) Charge Controller. How to size a solar panel? Solar Panel used directly with an appliance (direct coupled system): In this case it is important to know the voltage and current requirement of the appliance. Also it is important to make sure if the appliance runs on AC or DC. If the appliance runs on DC, it is better to choose a panel looking at Vmp and Imp ratings of the panel and try to get one that is close to the voltage requirement of the appliance. A MPPT charge controller additionally will be required to control the voltage. Energy from Solar Panel saved in batteries: In this case, it is important to look at the energy requirements of the system. Energy requirement can be calculated by multiplying the wattage of appliances to be connected with the hours of usage. For e.g if a system with one 75 W fan and two 15 W CFL are to be powered using solar panel for 10 hours each, then the total energy required is 75×10+2x15x10=1050 Wh. Now you will have to look at the Max Power (or Pmax) rating of the panel. If it is 525 W, then it will produce 1050 Wh in 2 hrs (=525×2). As a thumb rule it is assumed that good sunlight will be available for 5 hours. So a 210 W Pmax system would be sufficient for the needs. You may take slightly bigger system to accommodate for lesser power generated in certain conditions. In the second scenario, one has to also make sure that the batteries are sufficient to save the energy required and the inverter system is able to manage load. More on that in our future posts.